Swanson L-Ornithine is a dietary supplement. A single tab contains 500 mg of amino acid L-ornithine in a form of a hydrochloride. Ornithine – a non-proteinogenic amino acid which plays an important role in the urea cycle. It neutralizes ammonia, which is a metabolic waste. The toxic ammonia is a metabolic product of amino acid deamination – a reaction sequence by which proteins (amino acids) are broken down in order to obtain keto acids which make it possible to generate energy during cellular respiration. 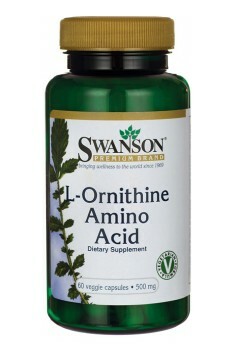 Ornithine is a product of the action of enzymes on L-arginine. Then, it combines with carbamoyl phosphate (a compound that consists of ammonia and carbo dioxide) forming citruline, which takes part in further metabolic changes that lead to the precipitation of urea. Ornithine (in a form of LOLA – L-Ornithine L-aspartate) is used to improve the process of ammonia reduction, as it accelerates the ammonia synthesis in the urea cycle that takes place in the liver. It improves the process of detoxication of liver and brain calls, it has a positive effect on protein, fat and carbohydrates metabolism and it can regenerate already damaged liver cells. The psychoactive mechanism of ornithine action has not been explained yet, but the research show that ornithine improves the quality of sleep, reduces mental stress and increases the secretion of growth hormone. The participants of the experiment fell asleep faster, they slept longer and they woke up feeling rested and refreshed. During the day, they also felt better. Cortisol is probably the most hated hormone in the world of sculpting sports. It is hardly surprising, because although its proper level has a positive effect during body shaping, persistently high level of this hormone (for example caused by training and lack of rest) increases catabolic breakdown of muscle and promotes fat storage. It is very interesting, however, the fact that ornithine can lower the cortisol level in blood requires further research. Some research has been already done on this subject – one group consisted of people who drank alcohol in the evening. In comparison to placebo recipients, the cortisol level in the morning, after waking up, was lower in the group of people who were using ornithine. To sum it all up, Swanson L-Ornithine is a dietary supplement that has numerous prohealth and therapeutic properties. The product is recommended for people who overload their liver metabolism (with alcohol, unhealthy diet, medicines) and for those who suffer from sleeping problems and chronical stress. Hypromellose (capsule), Anti-caking agents (Magnesium salts of fatty acids, silicon dioxide).